Libraries need to be both creative and opportunistic in the current climate. Opening the Book has helped to integrate a library offer with council Customer Services, independent community centres, parish council offices, a church with active worshippers and a theatre as well as sports and education centres. From quick advice to feasibility studies to full installations, we can help you make the most of your options and persuade others of the benefits of including a library. Our approach is based on evidence of customer behaviour in libraries, where we hold the largest databank of market research in the UK. 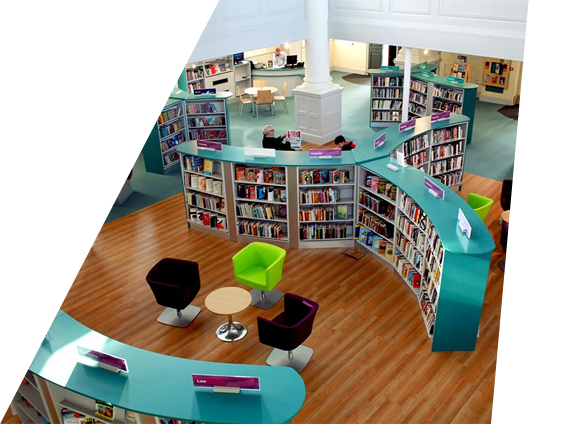 We also know the practicalities involved in running an efficient library service and can balance these with aesthetics to create the best possible experience for your library customers. Opening the Book is proud to have been appointed as an approved supplier to the Warwickshire Library Refit Framework. The Framework is open to all other library services in England and Wales to use; you can save time and money on procurement by using the Framework, secure in the knowledge there has been a full OJEU-compliant evaluation. We can supply feasibility studies, capacity and cost estimates, scaled layout plans, 3D visualisations and full furniture and fittings specifications. Our installations range from tiny shared facilities to changing the public face of the council in stunning new buildings. We can also help you articulate what libraries bring to the table, making you a desirable partner! Changing your library space means re-examining staff work processes. A refurb or new library is more than a lick of paint, it’s a chance to deliver a stronger and more efficient service. As more libraries introduce self-service, the role of frontline staff changes from issuing books to a more active engagement with customers and the environment. Our designs embed these changes. As the largest supplier of workplace training to UK public libraries, we bring to every project our outstanding track record in raising staff skills, energy and morale over the last 20 years.